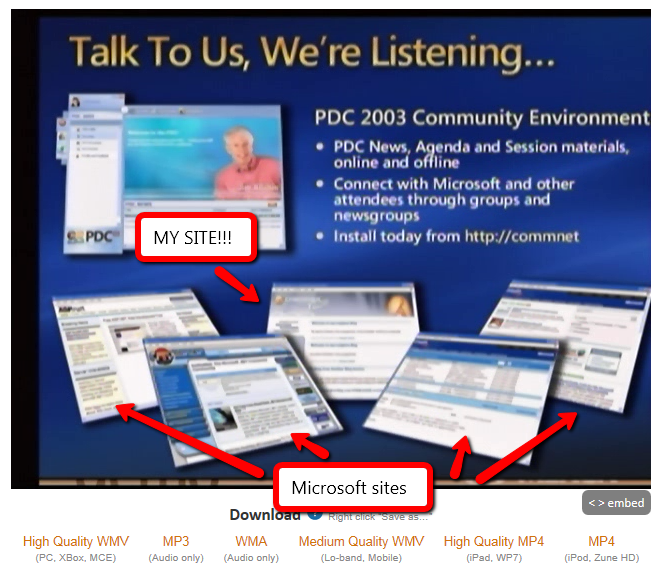 When I heard earlier today that Microsoft had put all of the Microsoft PDC keynotes online, I was very excited. But I have to admit, it was for selfish reasons. Because I would finally get to tell one of my favorite experiences. Apologies for the self-indulgent post… but then again, aren’t all my posts that way? I figured since the Rapture is coming in a few hours, I could indulge myself in a memory or two. You see, PDC 2003 was my first Microsoft conference. It was also time when those terrible fires in LA happened, that cancelled many flights out (including mine). It had been a crazy couple days trying to figure out how to get there, but I ended up having to take a bus overnight from Phoenix to LA. It was a long night, and I didn’t get any sleep the entire bus ride. It turns out, I ended up being an hour late. I was really disappointed at not being able to see Bill Gates speak in person. Corny, I know… he’s something of a hero of mine. Bite me. Anyway, I had WAAAAY overpacked, and ended up rolling into the middle of Allchin’s keynote with my HUGE suitcase. Who happens to be standing there but Robert Scoble. So we grab a seat, I’m excited but exhausted, and not 5 minutes later, this slide comes up. I didn’t have enough time to get my camera out, so I couldn’t catch a picture of the new Longhorn-focused website I had just launched on Jim Allchin’s slide deck. Had I been any more tired, I probably would have stood up and yelled “That’s my site!” But I kept it together. Later, Scoble told me that Gates, Ballmer, and Allchin were backstage checking out LonghornBlogs.com, and reading what people were saying about the conference (this was WAAAY before Twitter). I wish I could have seen that. At any rate. If you get a chance, you should take a look at the PDC 2003 and 2005 videos. Pretty interesting contrasts of what was going on at Microsoft before and after MSBlaster. That is, if you’re still here tomorrow. The pundits are all weighing in on the deal announced today to buy Skype for $8.5B, so I thought I’d resurrect my blog for a few minutes and offer my opinion as well. I think it is a great deal for both Skype users and Microsoft customers, but before I get into that, you should read Peter Bright’s take over at ArsTechnica, as it provides a great counterpoint. Skype as a software product is horrible. There isn’t a day that goes by where my Skype client doesn’t crash in the middle of a call. I get dropouts constantly. And it doesn’t work very well on consumer routers when both users are inside the same network. Microsoft is the one company I can trust to change all of that. Microsoft has spent the better part of the last decade building the best software development facilities on the planet. The Secure Development Lifecycle has helped Windows 7 have the fewest vulnerabilities of any version of Windows. Their automated testing facilities have thousands of virtual machines in different configurations, ready to beat the crap out of whatever is thrown at them. There is no doubt in my mind that Microsoft has the tools necessary to make Skype orders of magnitude more reliable. While the implementation is sometimes less than reliable, Skype does have an extremely effective peer-to-peer protocol. Microsoft has tried several times to emulate that protocol, with little success. Windows has a protocol built in, but I don’t use any applications that actually make use of it. Access to the BitTorrent-esque protocol could improve Azure services, for example, by providing a mechanism improving data transfers inside the Azure infrastructure. For example… it takes anywhere from 15-45 minutes to deploy an Azure application. Azure could leverage the transfer protocol to speed up replicating VM instances across physical machines, both inside and between Azure datacenters. It could also help replicate Azure CDN data between nodes more quickly. Both of which could significantly speed up deployment times. On the other hand, Microsoft may decide that Windows Peer-to-Peer is a better protocol, and move Skype to that instead. It would have the benefit of being already documented, which could pacify the EU and open source folk. It remains to be seen. Either approach would have a positive effect on end users. Speaking of peer-to-peer and Azure, the recent Skype outage should still be fresh in everyone’s mind. The cause was a bug in the way Supernodes communicated with each other. Skype’s solution to the problem was to host their own Supernodes, called “Mega-Supernodes”, that would always be available. By moving those nodes to Windows Azure, and hosting a cluster inside each Azure datacenter, Microsoft can easily and inexpensively improve the reliability of the Skype infrastructure. Node goes down? Replicate a new one. Plus, it gives Microsoft a great marketing tool (“Windows Azure improves Skype reliability by 40%! "), and a few more places (like the Skype client) to plaster a “Powered by Windows Azure” logo. Might be a powerful marketing tool to see an Azure logo on the startup screen of an app running on a Mac. Nobody does video streaming better that Microsoft. Period. For anyone that thinks Adobe is better… try watching a video on YouTube without it stuttering. Good luck. IIS Smooth Streaming is the best in the business, and there could be opportunity to bolster Skype’s video quality by leveraging that code, and/or Silverlight, to dramatically improve the video call experience. You Are the Weakest Lync. Goodbye. One of the first things I heard from Twitter is that buying Skype doesn’t fit in with the strategy of improving Lync Server and Lync Online sales, as they have a lot of overlapping features. That is exactly why it makes so much sense. For starters, adding Skype support to the Lync client only bolsters its adoption. The ability to connect Lync-ified internal communications with external audio and video conferencing is HUGE. I can’t tell you how many times I’ve used SkypeOut to dial into a LiveMeeting conference call. With Skype in my Lync, that should no longer cost me money. Also, if you’re a company looking to switch from Comcast Business Telephone to Lync, you still have to subscribe to a SIP provider if you want to take external phone calls, which complicates the Lync server setup process. $8.5B just bought Microsoft a huge network of physical machines that connect Skype to the PSTN. That gives Microsoft an “in” to be able to provide that service to customer out-of-the-box, without violating their partner agreements with SIP providers. This is how Microsoft started offering Hosted Exchange as a service, by purchasing a Hosted Exchange provider to beef up their internal infrastructure. That means Lync Server could have a better out-of-the-box experience that doesn’t require signing up for other outside services. Plus it gives Microsoft another PSTN provider for Lync Online’s audio conferencing and phone connectivity. Whether or not Windows Phone 7 is successful is a hot topic of debate among pundits, especially since Microsoft (or any of their partners, for that matter) haven’t released any solid numbers about sell-through to end users. Some carriers (I’m looking at you, Verizon) have given WP7 the cold shoulder thus far, alienating some of their customers (like me). Purchasing Skype means that now carriers have no choice but to deal with Microsoft, because Skype is on practically every phone out there. “Hey [insert carrier name here], want us to improve Skype protocol efficiency on your network? We won’t do it unless you’re selling at least one WP7 device.” Some anti-trust, Android lovers may bristle at that… but ultimately it’s good for consumers, who need an effective counterweight against bully carriers. (We all know Google got too caught up in money to fight THAT fight). If you think about it, the Skype acquisition fits in perfectly with Microsoft’s “Three screens and the Cloud” strategy. Skype is on millions of devices, sold by thousands of retailers, and manufactured by dozens of companies. Every one of those devices has one of the three screens Microsoft wants to dominate. Plus, it means that Microsoft doesn’t have to wait for Skype to get a Round Tuit for integration with existing Microsoft products like Kinect, in-game chat on Xbox Live, and Windows Phone 7. They can ensure that those devices have first-class support, which will only be good for consumers. At the end of the day, this has as much to do with the purchase as anything else. Skype is on the iPod, iPhone, and iPad, as well as Apple TVs. Skype is on the Google TV. Now Google and Apple both will have to deal with Microsoft directly on these platforms, which in turn with give Microsoft a great competitive advantage. Microsoft now owns one of the only solid ways for Apple users to video chat with non-Apple users. Nothing like a little forced coop-etition to stick it to your enemies. How about them apples? Look, Microsoft’s stock hasn’t moved in ages. The reason is not because Microsoft isn’t making outstanding products, because they are. It’s because the tech press (with a few notable exceptions) spends their time falling all over themselves to win the affections of Google and Apple, which in turn means that the general public doesn’t get exposed to positive articles about Microsoft. So if the market isn’t going to pay attention anyways, why not make bold, risky bets to better the brand? Complain all you want about failed acquisitions, but Microsoft has a better track record of integrating acquired companies than Google and Yahoo have. Google and Yahoo have bought and killed more companies than Genghis Khan killed actual people. So screw it. Go for broke. Why not? The injection of a successful brand and fresh blood into the company may be just what Microsoft needs to take back some more mindshare from people too enamored with Apple’s shiny design and Google’s nefarious plans to care otherwise. So what do you think? Did I miss the mark? Sound off in the comments .